Not long ago (earlier this year) I had to repot this houseplant because it was getting too big for its britches. I had watched The professional, a movie with Natalie Portman who decides to take up residence with an assassin. 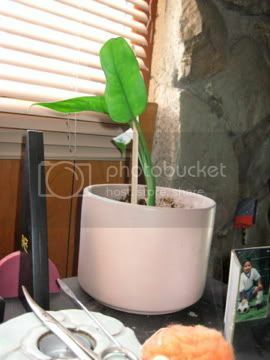 The assassin happens to have a plant similar to this, so I decide to transplant half of it outside and repot the other half. What happened was the fuller portion I planted outside died, but the fragments I placed in multiple pots took root. Today I decide to add water and what do I see?! Indeed, this may not be work safe at all. The other pot does not have this growth (no pun). Is it a fungus? 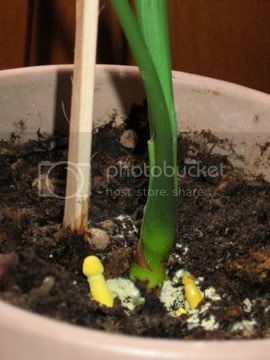 A root? Mushroom, for lack of a better term? One of the differences between this potted plant and the second pot is that I'm not draining this one (the little holes at the bottom of pots here doesn't exist). If I find that spaying or neutering plants is something I just completely overlooked, I will create a tag for this entry and keep you apprised of my findings. This reminds me of the other day when Schulz was sharing e-mail FWDs with me and the subject of photography was "drunken pass outs". There was a picture of a guy to shitted himself, a guy who puked himself, and finally a guy wearing shorts with his scrotum exposed. As Molly Wood from The Buzz Report would say, "Unsee! Unsee!" 'ey mate, maybe you could try jackin' 'em off and see what happens. Maybe you've somehow ripped a hole into another universe in all that, and tiny yellow men are sleeping under it.